Instrumentation engineers / electronics engineers in manufacturing and process industries; Data Acquisition & Control (DA&C) system designers / integrators; Control and Instrumentation Engineers; Industrial system integrators; Students taking electronics or computing degree courses; Electrical, mechanical and chemical engineers and technicians wishing to understand the essentials of data acquisition. 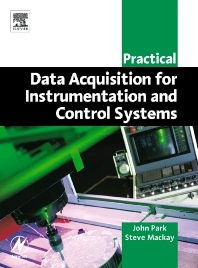 Introduction to Data Acquisition & Control; Analog and Digital Signals; Signal Conditioning; The Personal Computer for Real Time Work; Plug-in Data Acquisition Boards; Serial Data Communications; Distributed & Standalone Loggers/Controllers; IEEE 488 Standard; Ethernet & LAN Systems; The Universal Serial Bus (USB); Specific Techniques; The PCMCIA Card; Appendix A: Glossary; Appendix B: IBM PC Bus Specifications; Appendix C: Review of the Intel 8255 PPI Chip; Appendix D: Review of the Intel 8254 Timer-Counter Chip; Appendix E: Thermocouple Tables; Appendix F: Numbers Systems; Appendix G: GPIB (IEEE-488) Mnemonics & their Definition; Appendix H: Practical Laboratories & Demonstrations; Appendix I: Command Structure & Programming. John Park is a staff engineer with IDC Technologies with a particular interest in electronics, circuit board design and data communications. He has presented training courses throughout the world to over 15,000 engineers and technicians. Steve Mackay is a professional engineer with over twenty-five years' experience throughout the world with a particular interest in data acquisition techniques, industrial data communications and process control. He is the Technical Director of IDC Technologies and consults widely to clients in the oil and gas, mining and manufacturing industries. Steve has presented courses to over 12,000 engineers and technicians throughout the world.